A world record stands in the balance Sunday as the 35th annual Naha tug-of-war unfolds in downtown Naha. 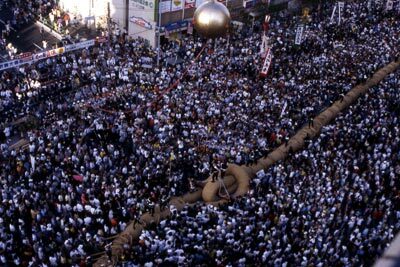 Tens of thousands will join hands trying to move a 40-ton rope in the great Ryukyu Kingdom Festival Tsunahiki, an event that first made its way into the Guinness Book of World Records in 1997. The rules are simple; an estimated 25,000 men, women, boys and girls will team up with either the east or west side to shift the behemoth five meters during a half-hour competition. An estimated 300,000 spectators will gather on Route 58 at Kumoji Crossing in downtown Naha for the tug-of-war, which ceremonially begins Sunday at 3pm when representatives of four teams from east, and four from the west, perform a series of martial arts demonstrations. After speeches and praise for the 16 tug-of-war teams making up the two sides, the fun begins. The two lengths of rope, each measuring some 300 feet long, are pulled together and coupled with a 10-foot wooden peg. Hundreds of pulling ropes are separated from the main rope, and all hands grab on, waiting for the signal. Once given, the pulling begins to cries of Œyoishi¹, O-Shoi¹ and ŒHai-ya¹, meaning heave ho, or pull harder. The battle lines are formed, with east and west each trying to move the rope five meters within 30 minutes. The tug-of-war dates back to 1600, when it served a dual purpose. Villagers from east and west did honorific battle for victory as a sign to shamans who predicted the future. The prayers were for a good rice harvest. The second motive was to instill peace and stability into the lives of seafarers of this island nation, and to insure their safety. The tug-of-war rivets spectators during the hour-plus event, after which knives come out for everyone to cut ceremonial pieces of the rope to take home. It¹s the highlight of the Ryukyu Kingdom Festival, which Sunday begins at noon with an Okinawan ancient times masquarade, with flag masters dancing and parading down Kokusai Street. The festival actually begins moving to high gear Saturday afternoon at 3:45pm with a Kokusai Street Parade attracting local and international street performers and eisa dancers to tout their skills in front of more than 30,000.
fireworks displays launched over the Naha skyline. All events and activities are free along Kokusai Street and the Sunday Tsunahiki on Highway 58. Costs for foods and souvenirs vary depending on taste and desires, while parking is anything but free. Parking is difficult, and expensive. But remember, parking illegally is even more expensive. For those on a budget, consider tours offered by Marine Corps Community Services, including the Single Marine Program, 18th Services on Kadena Air Base, Navy MWR or Army MWR from Torii Station. From the military bases, head south to Naha City. As you pass Tomari Port and the Tomarin Hotel on the right, you¹ll find the first opportunities for parking. Turn left or right off Highway 58 and look for the blue ³P² signs. The alternative is to continue further into the city, crossing the bridge adjacent to Naha Military Port, and then looking for the parking signs. For those planning to make full day excursions, the more southern parking is recommended; once tired, the shorter walk back to the car will save a lot of wear and tear on the ol¹ body. For those not interested in battling the large crowds, a couple smaller events take place earlier in the weekend. The Itoman Giant tug of war takes place Friday from 2pm to 6pm at Itoman Rotary at Kokudo, Highway 331. Futenma celebrates its Futenma Lion Dance Festival Friday at Futenma Park, showcasing traditional Okinawan dance. The Ryukyu Dynasty Moon Viewing Festival runs Friday through Sunday at Shuri Castle Park, located at 1-2 Shuri Kinjo-cho in Naha City. The evening 6pm~9pm performances feature a the Mid-Autumn Banquet held during the Ryukyu Dynasty period of Okinawa¹s history.